Yeah - I know - not the best or wittiest headliner. Well - but here we are - talking about those 3 gins, all of them coming in blue bottles: Bombay Sapphire, Star of Bombay and Citadelle. However this won’t be a review - or an objective side by side comparison... just my impressions. I have got to admit, since Bombay Sapphire has been introduced, I actually liked it pretty much - and I can honestly say, that it has been one of my favorite gins. Probably you could even say, that Bombay Sapphire was the first gin, I’ve genuinely appreciated (and in those days, not a lot of people drank gin - nor where there a lot of options out there). My appreciation took though a slight dip, when Bacardi took over the reigns and reduced “their” gin in most markets from 47% to 40% abv. In Dubai though, the 47% abv version is still used, which is fantastic. In this impression, I would say, that Bombay Sapphire is definitely in the top group of gins - it might be not as fancy, or nouveau than the new kids on the block, but in a blind tests of let’s say 20 or more gins, it would for sure get one of the top 5 spots. Great gin, great price... cheers! With all of those new kids gins on the block, Bacardi might have thought, that they had to up their game. They have had a very limited release of a different expression of a more premium Sapphire (I haven’t tried), and they have introduced their “Asian” brother of “basically the same mother” - Bombay Sapphire East (I don’t really like it... probably it is the low alcohol content). But since a couple of month, they released Star of Bombay - which should be a more premium expression of Bombay Sapphire. When you check out reviews, you will find, that most people really like “Star of Bombay”. In its defense, the abv is even a tiny bit higher than the magic 47% at 47.5% abv. I think, that the bottle reminds a bit too much on the old Tanqueray ten bottle... but it is blue and it is pretty. But here is the thing: it didn’t do a “better job” than the normal Bombay Sapphire 47% - even worse, I prefer the “classic”. The aromatic is very similar to the original, only that it gets a bit more “clinical” around the corner. Due to the fact, that it is far more expensive and that it isn’t really my taste, I cannot whole heartedly recommend it. So I had to buy a new bottle or two of juniper liquor (because my girlfriend is “nibbles”... and I had already the bottle of classic Bombay Sapphire, when I seen the other blue bottle: Citadelle. I know, that this gin has far more botanicals than Bombay Sapphire - and this is neither good nor bad... but I thought that it cannot really hurt. I have to say, that I had now several gins, which just didn’t brought it for me: Star of Bombay was the last one, Beefeater 24 wasn’t also that much impressive, Portobello Road nice, but not that memorable... I might just suffer of a gin exhaustion... hence I didn’t expected a lot, when I tried Citadelle. But hell - even though it is around for quite a while, and isn’t really part of the New (Gin) Power Generation it really delivers. It isn’t so unique... just a fresh, characterful gin, which is easy to drink, but has still some alcoholic backbone - 44% to be precise. And those 44% are actually not too less, to make a mean G&T or Martini with this French gem. 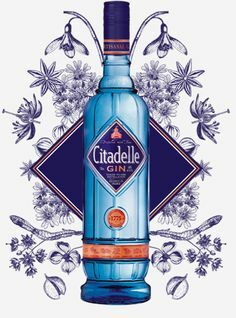 What really surprised me is, that Citadelle is distilled by Pierre Ferrand, a Cognac house which incidentally also produce Saffron gin and G’vine. I honestly think, that there are too many gins on the market now. It seems, that gin went the same route as vodka - well I give gin the benefit of a doubt, as every gin is different, yet it is very difficult to really keep the overview which gin is best for what. Reviews are also not very much helping, as there is a lot of perception, which also works against a transparent playing field. In the bar, I suggest to focus on few distinct gins, which not only are tasting good according the people who are selling them (make blind tests! ), but also are different enough, to be a differentiating option for the different taste of guests as well as for different cocktails and drinks. Out of todays three gins I would recommend normal Bombay Sapphire and maybe a tad more Citadelle (points for value for money goes mostly to Bombay Sapphire - however Citadelle isn’t as expensive as some “premium” options... yet far more expensive as Sapphire). But to be honest, if you would have Bombay Sapphire, don’t bother to buy an additional bottle of Citadelle... just maybe think of picking up one, when the “Bombay” needs to be replaced. Diversity is always great!